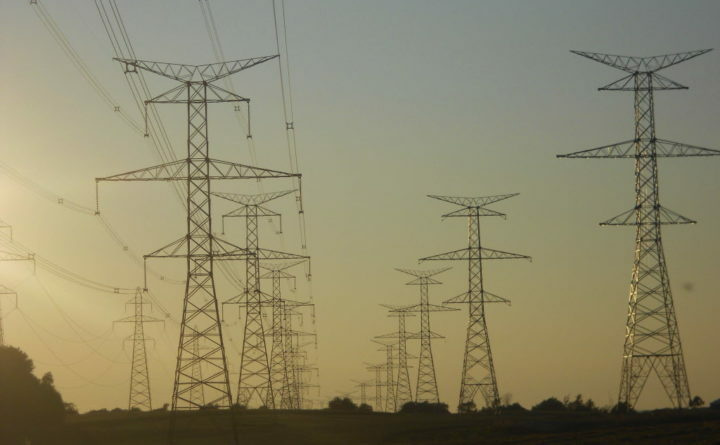 In this Aug. 16, 2011 file photograph, transmission lines are shown north of Hanover, Ontario, Canada. A project proposed by Central Maine Power and Hydro-Quebec was chosen as an alternative bid by Massachusetts officials who want clean energy delivered to their state by 2022. Central Maine Power Co.’s plan to build a transmission line from the Canadian border through western Maine to bring hydropower to Massachusetts passed a critical step Thursday, when the Maine utility and Massachusetts electricity distributors said they had signed a contract. The contract, which was not made public, reportedly details the terms and energy price for the project. Through those prices, Massachusetts ratepayers ultimately will foot the bill for CMP’s $950 million New England Clean Energy Connect project. The brief statement on the Massachusetts Clean Energy website said the electric distribution companies “have successfully concluded negotiations and executed long-term contracts” with CMP and renewable power generation and distribution company HQ Energy Services (US) Inc. for the NECEC project. The distribution companies will be seeking approval from the Massachusetts Department of Public Utilities for the executed long-term contracts and will be making a filing in the coming weeks. The distribution companies are Eversource Energy, National Grid and Unitil Corp.
“The conclusion of these negotiations marks a significant step forward for the NECEC,” Doug Herling, president and CEO of CMP, said in a statement. CMP spokesman John Carroll said the contract is a mechanism to fund the NECEC. The distribution companies had to change course after New Hampshire regulators nixed that state’s Northern Pass plan, which was Massachusetts’ first choice for bringing more renewable energy to the state. Maine’s plan became the frontrunner in March. CMP and Hydro-Quebec are collaborating on the project, which aims to bring renewable power to Massachusetts by 2022 so that state can meet its own clean energy standards. “In the coming months we’ll be working closely with Central Maine Power to complete this important new interconnection project which will not only reduce carbon emissions, but will also bring price stability and supply reliability to the region,” Eric Martel, president and CEO of Hydro-Quebec, said in a statement. Carroll said the Massachusetts regulator will hear public comments and conduct a fully litigated case to consider approving the contract. The NECEC project also needs to be approved by Maine regulators, and is under review by the Maine Department of Environmental Protection and the Maine Public Utilities Commission. It also will need federal approval, because it crosses the border into Canada and north to Quebec City. CMP said it submitted applications for all state and federal permits in mid-2017. The company expects to receive state approvals later this year and final federal permits in early 2019. If approved by Maine regulators, the NECEC project would both build new transmission lines, from Beattie Township in Franklin County on the Canadian border to Lewiston, and upgrade existing infrastructure. The proposal to transmit hydropower 145 miles from the Canadian border through western Maine and to the New England electric grid has drawn vocal opposition from groups questioning its environmental and economical benefits to Maine. The Natural Resources Council of Maine was quick to respond to news of the contract. “The Natural Resources Council of Maine and many other organizations are deeply concerned that the proposed New England Clean Energy Connect will not result in a reduction in carbon emissions and may even contribute to an increase,” Dylan Vorhees, clean energy director at the the NRCM, said in emailed comments. “We urge decision-makers in Maine and Massachusetts not to approve any project that does not provide strong evidence of an overall reduction in climate changing pollutants,” Vorhees said. Hydro-Quebec spokeswoman Lynn St-Laurent disagreed with the NRCM by saying the NECEC will cut carbon emissions by over 3 million metric tons in the New England region. “Hydro-Quebec’s exports displace fossil fuel generation in markets outside Quebec. For significant progress against climate change, the region will need clean baseload energy, such as hydropower,” she said. CMP’s Herling told the Bangor Daily News in mid-May that the utility is trying to take the project through the least amount of sensitive wilderness area, and has worked with landowners and some outdoors groups to mitigate the visual impact. One hot spot is the scenic Kennebec River Gorge, located in a remote and pristine area of Maine. CMP has said it was willing to bury cable under the gorge, but that could cost the company up to $40 million, Herling said. He added that CMP was trying to work with rafting and other groups to help them develop tourism in the area to mitigate any obstructions to scenic views. On June 6, CMP said it had reached a memorandum of understanding with the Western Mountains and Rivers Corp., a Somerset County nonprofit, for investment in western Maine conservation and nature-based infrastructure. The deal could be worth up to $22 million, according to Maine Public. CMP would transfer certain scenic lands along the Dead River to the nonprofit, assist in the potential development of a visitor center and fund education programs and trail development and maintenance. CMP also agreed to install fiber optic cable that will enhance broadband and Wi-Fi access for residents and businesses of Somerset and Franklin counties along Routes 201 and 27.